Inside Youth Sports: Are You a "Teach Everyone Everything" Coach? Team roles often provide young players with a clear path to immediate success. They represent a great starting point for the beginning player. When an inexperienced or otherwise immature player understands how to meaningfully contribute to his or her team, self-esteem grows and broad smiles begin to appear. But youth coaches should carefully avoid limiting any young child’s potential. A child’s body, skill level, and aptitude for a given sport are constantly changing throughout his or her youth. The success an athlete enjoys later in life may be entirely different from the success enjoyed as a child. So how does a coach best prepare each child for the opportunities that may appear later in the athlete’s development? The answer for most youth sport programs is a coaching philosophy I refer to as “Teach Everyone Everything” (TEE). The primary principle of TEE is to provide every child on a team with equal opportunity to instruction. As described above, the TEE approach recognizes that each child is on a developmental journey. TEE provides the solid foundation of skills and knowledge that will enable a child to successfully transition to new athletic roles as he or she matures. In practices, the TEE coach instructs all of his or her players how to perform each fundamental skill—even when the child’s size and ability may dictate playing a position or role that doesn’t require certain skills. 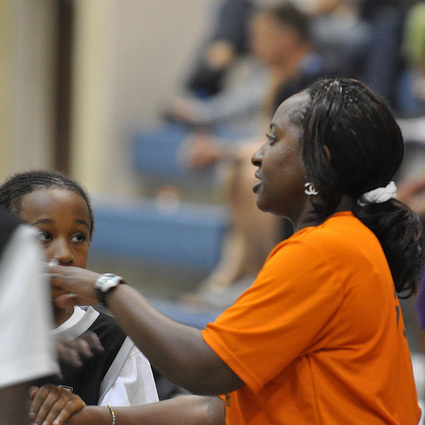 In games, the TEE coach attends to all of his or her players regardless of how playing time is distributed. Many teaching moments arise in games, both for the active players and those watching from the bench. When a player makes an excellent play or mistake, the TEE coach not only addresses the player, but also other kids on the team who may benefit from the coach’s instruction. The TEE coach searches for opportunities in games to place players in situations where they can develop and grow. He or she balances these opportunities, the benefits of assigning team roles, and the needs of others on the team, to provide the best path to success for each individual child. Every child receives equal instruction in practice on how to perform fundamental skills. Each child receives equal attention in both practices and games (but not necessarily equal playing time). Throughout the season, opportunities to expand each child's roles are explored in both practices and games. In basketball, one or two players on a team usually play close to the basket (low post). These players must understand the principles of low post play and how to play with their back to the basket on offense. When looking to score from the inside, a player must gain position, present teammates with a target (raise a hand), use proper footwork (pivoting), “seal out” the defensive player, and finally convert the shot from short range. More advanced techniques include fakes, and progressions of moves. A basketball coach focused on maximizing his youth team’s win-loss record might consider only teaching low post skills to his or her tallest players. Likewise, this coach might have an assistant teach more advanced dribbling techniques only to the children playing the guard position. With limited practice time and the need for players to assume certain roles, it’s understandable that a youth coach might believe this is the best, most efficient approach. But consider the potential long-term effect of selectively teaching different techniques to different players. As mentioned in the beginning of this topic, each child will likely go through dramatic changes as they mature. A tall 10-year-old boy may eventually become a 5’10” guard on his or her high school team. Likewise, the young girl who has good ball handling skills (but is short) may grow to be one of her high school team’s tallest players. If you fail to provide early instruction on the techniques that a child will later need, you may impair the child’s opportunity for success. There our other reasons for employing the TEE approach. Many game situations at higher levels of play involve “match-ups”. Although a player would not normally play a certain position, his or her opponent may present a match-up opportunity. In our basketball example, consider a match-up where a smaller opponent is defending a guard who normally plays away from the basket. Because of the size mismatch, the offensive player may be able to “take his player low”, isolate the defender, and easily score a basket when a teammate passes the ball to him. But what if this player has never learned the skills necessary to play the low post position reasonably well? The advantage is lost. Skills primarily used in one position or team role are also sometimes helpful in other situations. For example, knowing how to play with your back to another player can help a basketball guard more easily receive a pass away from the basket when defended aggressively. Practice provides you, the coach, with the opportunity to teach all of your players a sport’s fundamental skills. Games provide your players with the opportunity to put these new-found skills to use. Although TEE may fit more readily into your practice instruction, you can also use this approach in games—especially in youth programs that emphasize participation. Try to find opportunities for your players to occasionally step beyond their primary role. In many sports, it’s easy to move a child from one position to another during a game. Although a child may lack the skills to play a position well, let him or her try. Pick moments that provide the child with a better chance to succeed (when the other team is playing its weaker players, for instance). You can even find opportunities for your least skilled beginners to play a key position. For example, toward the end of a one-sided basketball game, you might rotate a different player into the point guard position each time down the floor. Make sure that everyone on your team is in on the fun, and they understand that you’re not concerned about the inevitable turnovers. Also, emphasize to your players that each of them is responsible for putting the skills you teach to good use in his or her individual practices and neighborhood pickup games. The latter is often where a young athlete learns how to actually apply a skill in a way that works for him or her. With some children (especially younger ones), a full cycle may occur within your season. In these cases, you will enjoy one of the more rewarding aspects of coaching youth sports—witnessing the rapid development of a child’s abilities and self-esteem under your tutelage. But more often, the benefits will accumulate through the entirety of a child’s youth sports experience. Finally, TEE also provides the best path to lifetime success in sports. Learning all of the fundamental skills to competently play a sport, increases the chance children will continue to play a sport into their adult years. With a fuller understanding of the game, they will enjoy more success in pickup games and find greater acceptance within the community of individuals that play their sport. that results in winning (eventually)."